Jack Hammer is a powerful Canadian pit fighter who appears at the beginning of Season 2 of the anime, the Maximum Tournament Arc. Baki&#039;s half brother, like Baki, must follow the Hanma path. He is the son of Yujiro and a Canadian soldier woman who Yujiro met in Vietnam, during the Vietnam War. 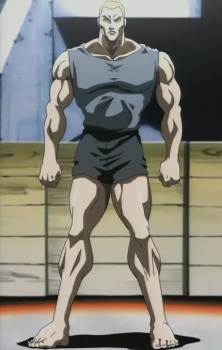 Like Baki, he has since childhood wished to surpass his father Yujiro in strength and martial ability. His obsession to defeat his father led to extreme over training and overworking of his body which led to the deterioration of his body, claiming he will never be able to defeat his father with normal training. After his encounter with the Yujiro inspired scientist, he received from him steroids to match his overtraining and has gained his immense power. One of his main techniques is biting, and he can bite hard enough to easily crush wood with his teeth. He fights Shenusiba in round 1, Misaki Kengo in round 2 before beating the unbeaten Andre Andov Garrand in round 3. In round 4 he fights Gouki Shibukawa and fights Baki Hanma in the finals of the Maximum Tournament where he congratulates his brother for a well fought victory. Afterwards, he takes on his father and is soundly defeated. Makes an appearance in the "Search of our Strongest Hero&#039; series and battles against the Russian convict Sikorsky and Mohammed Ali Jr. Is treated by Kureha Kosho by having his limbs extended, making Jack Hammer even bigger than when he fought in the maximum tournament. In the English dub, his name has been changed to Jak Xamma (pronounced "Zah-mah"). He reappears in Baki : Son of Ogre, in the military base where Pickle is captive, along with 7 others fighters (Doppo Orochi, Katsumi Orochi, Jyaku Kaiou, Retsu Kaiou, Kureha Shinogi, Gaia, Gouki Shibukawa).